Situated inside olive oil farm, Altabina enjoys a panoramic position over the valley and the large hills planted with olive trees. 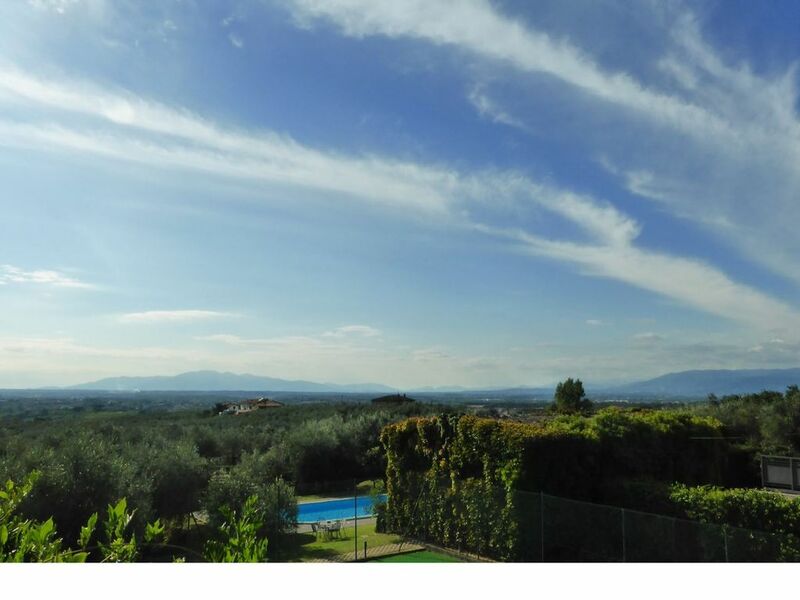 The house is strategically well-positioned, in fact, from here you can easily reach the centre of Lamporecchio as to the main destinations of Tuscany region. VINCI where Leonardo Da Vinci was born is only a few minutes away. The house is characterized by wide open spaces for the exclusive use; there is also a tennis court&nbsp; with synthetic field and a large pool all at the exclusive use of the guests. Possibility to purchase Chianti wine and olive oil.In the main house there is only the office of the owner, nobody lives there. INTERIOR&nbsp; Leading up to a staircase of 14 steps, there is the equipped terrace from which you have the access to the living area of the house, consisting of corner kitchen, dining and sofa. From here there are two doors, each of which leads to a double bedroom with bathroom with shower. The living area is equipped with air conditioning (from 2014 season). OUTDOORThe garden of Altabina is completely fenced and covers an area of about 1100 square meters of land, mostly characterized by gardens, olive trees, plants and flowers and is made more comfortable and cozy thanks to the presence of facilities to host every moment of relax of who is hosted in the property. In a corner of the garden there is a large barbecue area with a large table, ideal for dining and also a large tennis court with synthetic surface. The pool has an oval shaped with chlorine purification and measures about 18,50 x 7 mt. The entrance to the pool is facilitated by an internal staircase. The pool area is a natural lawn and is equipped with sun beds, deckchairs and umbrellas. ON REQUEST:&nbsp; heating in case of use (on consumption up to date market prices), air conditioning in case os use (on consumption up to date market prices), additional cleaning (15,00 Euro per hour /cleaner), additional change of linen (15,00 Euro per person), pool towels (3,00 Euro per towel, on previous request). Unterkunft war wie auf den Fotos beschrieben. Es war alles vorhanden und sauber. Der Pool war absolut spitze, den werden wir am meisten vermissen. Wir haben uns auch mal am Tennis spielen versucht. Schöner Ausblick.